Original Editors - Steve Blakely from Bellarmine University's Pathophysiology of Complex Patient Problems project. Benign paroxysmal positional vertigo (BPPV) is a specific type of vertigo that is brought on by a change in position of the head with respect to gravity. This disorder is caused by problems in the inner ear. Its symptoms are repeated episodes of positional vertigo, that is, of a spinning sensation caused by changes in the position of the head. The vestibular system monitors the motion and position of the head in space by detecting angular and linear acceleration. The 3 semicircular canals in the inner ear detect angular acceleration and are positioned at near right angles to each other. Each canal is filled with endolymph and has a swelling at the base termed the ampulla. The ampulla contains the cupula, a gelatinous mass with the same density as endolymph, which in turn is attached to polarized hair cells. Movement of the cupula by endolymph can cause either a stimulatory or an inhibitory response, depending on the direction of motion and the particular semicircular canal. There is a vestibular apparatus within each ear so under normal circumstances, the signals being sent from each vestibular system to the brain should match, confirming that the head is indeed rotating to the right, for example. Within the labyrinth of the inner ear lie collections of calcium crystals known as otoconia. In patients with BPPV, the otoconia are dislodged from their usual position within the utricle and they migrate over time into one of the semicircular canals (the posterior canal is most commonly affected due to its anatomical position). When the head is reoriented relative to gravity, the gravity-dependent movement of the heavier otoconial debris (colloquially ear rocks or crystals) within the affected semicircular canal causes abnormal (pathological) fluid endolymph displacement in the affected ear. This fluid displacement will send a signal to the brain indicating that rotational movement is occuring. However, the vestibular apparatus in the unaffected ear will not be transmitting the same signal because there are no loose otoconia triggering the hair cells abnormally. This resultant mismatch in signals coming from the right and left vestibular systems lead to the sensation of vertigo. This more common condition is known as canalithiasis. Vertigo associated with this condition will be of short duration, even if the person with the condition stays in the provocative position, because the endolymph and otoconia will quickly come to a rest so the hair cells will no longer be displaced and triggering the signal to the brain. In rare cases, the crystals themselves can adhere to a semicircular canal cupula rendering it heavier than the surrounding endolymph. Upon reorientation of the head relative to gravity, the cupula is weighted down by the dense particles thereby inducing an immediate and maintained excitation of semicircular canal afferent nerves. This condition is termed cupulolithiasis. Vertigo associated with this condition will not resolve until the head is moved out of the provocative position because even when the endolymph comes to a rest, the adhered otoconia will continue to displace the hair cells and trigger the signal of movement to the brain. Benign Paroxysmal Positional Vertigo (BPPV) is the most common cause of vertigo, which is a symptom of the condition. Though not fully understood, BPPV is thought to arise due to the displacement of otoconia (small crystals of calcium carbonate) from the maculae of the inner ear into the fluid-filled semicircular canals. These semicircular canals are sensitive to gravity and changes in head position can be a trigger for BPPV. The posterior canal is the most commonly affected site, but the superior and horizontal canals can be affected as well. It should be noted that the superior canal is sometimes also referred to as the anterior canal and the horizontal canal is sometimes referred to as lateral canal. 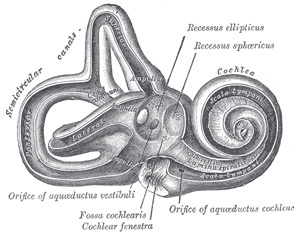 The peripheral vestibular labyrinth contains sensory receptors in the form of ciliated hairs in the three semicircular canals and in the ear’s otolithic organs. They respond to movement and relay signals via the eighth cranial nerve. Visual perception such as gravity, position, and movements also receive signals from somatosensory receptors in the peripheral vestibules. With the displacement of the otoconia into the semicircular canals, these delicate feedback loops relay conflicting signals that can result in any symptom related to BPPV. BPPV can be classified as cupulolithiasis and canalithiasis. Cupulolithiasis is when the otoconia are adhered to the cupula, whilst canalithiasis is when the otoconia are free floating in the canal. Additionally, the type of nystagmus that a patient may display can be classified as geotropic or apogeotropic. Geotropic describes the nystagmus as a horizontal beat towards the ground. Apogeotropic describes the nystagmus as a horizontal beat towards the ceiling. The most common cause of BPPV is idiopathic. However, the vestibular system of the inner ear can also undergo degenerative changes as one ages which can attribute to a potential cause of BPPV. Under age 50, head injury is a common cause. Vestibular viruses and Meniere’s disease also play a role. BPPV can also be a result of surgery due to prolonged supine positioning and possible trauma to the inner ear. Dizziness is the complaint in 5.6 million clinical visits in the United States per year, and between 17 and 42 percent of these patients are diagnosed with BPPV. The recurrence rate for individuals at one year following initial bout of BPPV is 15% and at 5 years the recurrence rate is 37-50%. Individuals with a clinical diagnosis of anxiety are 2.7 times more likely to develop BPPV. Unilateral posterior canal is the most commonly affected canal in BPPV with 90% of all BPPV diagnosis. Unilateral horizontal canal affects 5-15% of all BPPV diagnosis. Within a horizontal canal diagnosis, 2/3 of the cases are geotropic while 1/3 of the cases are apogeotropic. Anterior canal affects 1-2% of all BPPV diagnoses, which is the least common. The lifetime prevalence is 2.4 percent. Vomiting is uncommon, but possible. Severe: vertigo with most head movements, which can appear as continuous vertigo. Individuals with BPPV can have symptoms that last days, weeks, months or years before it is resolved. Rotatory (torsional) nystagmus, where the top of the eye rotates towards the affected ear in a beating or twitching fashion. The condition is diagnosed from patient history (feeling of vertigo with sudden changes in positions) and by performing a positional test. Different positional test exist. The exact positional test used to confirm the presence of BPPV will depend on which semicircular canal is involved. The most commonly used test is Dix-Hallpike which assesses involvement of the posterior canal (the most commonly affected semicircular canal). The test involves turning the head 45 degrees to the side being tested and then quickly moving from a seated to a supine position with the head declined 30 degrees below the trunk. The test must be performed quickly to ensure sufficient displacement of the endolymp and otoconia to provoke the expected symptoms. The test is considered positive for canalithiasis of the posterior canal if vertigo is provoked and nystagmus is observed, both of which should be of short-duration for canalithiasis. The direction of the observed nystagmus should be consistent with the canal being assessed. For the posterior canal, nystagmus should be up-beating and torsional in an ipsilateral direction (if testing the affected side. If the left side is affected but the test is performed with the head turned to the right, the nystagmus would be up-beating and torsional to the right). Patient is supine. Examiner flexes the cervical spine 20-30 degrees. Slowly return patient's head to midline. Next, quickly rotate patient's head to the left approximately 45 degrees.Hold for 30 seconds or until nystagmus and/or other symptoms have subsided. Test is positive for nystagmus of other symptomatic complaints during the test. The patient may be positive on both sides. If this happens, the side that has more intense symptoms is considered the affected side. Examiner first bends the patient’s head forward 30 degrees. Reassess nystagmus. Patient’s nystagmus should disappear because the horizontal canal is now in a true horizontal position. Examiner then bends the patient’s head forward to 60 degrees. Reassess nystagmus. A fast paced nystagmus may be present. If the nystagmus is being caused by the otoconia moving, the nystagmus will beat toward the affected ear. If the otoconia is attached to the cupula, the nystagmus will beat towards the unaffected ear. The nystagmus associated with BPPV has several important characteristics which differentiate it from other types of nystagmus. If nystagmus and vertigo are sustained, cupulolithiasis or a potentially more central cause of vertigo should be considered. Patient history and other neurological tests can help to rule out a more serious central cause. May need to complete this maneuver 1 to 3 visits complete resolution of symptoms. Devices such as a head over heels "rotational chair" are available at some tertiary care centers. Home devices, like the DizzyFIX, are also available for the treatment of BPPV and vertigo. BPPV is a benign diagnosis so treatment is not always needed. Occasionally, BPPV can resolve itself with no intervention. Drug treatments are not presently recommended for BPPV and bilateral vestibular paresis. Prophylactic agents (L-channel calcium channel antagonists, tricyclic antidepressants, beta-blockers) are the mainstay of treatment for migraine-associated vertigo. In individuals with stroke or other structural lesions of the brainstem or cerebellum, an eclectic approach incorporating trials of vestibular suppressants and physical therapy is recommended. Psychogenic vertigo occurs in association with disorders such as panic disorder, anxiety disorder and agoraphobia. Benzodiazepines are the most useful agents here. Undetermined and ill-defined causes of vertigo make up a large remainder of diagnoses. An empirical approach to these patients incorporating trials of medications of general utility, such as benzodiazepines, as well as trials of medication withdrawal when appropriate, physical therapy and psychiatric consultation is suggested. ↑ 4.0 4.1 4.2 Ogun OA, Janky KL, Cohn ES, Büki B, Lundberg YW. Gender-Based Comorbidity in Benign Paroxysmal Positional Vertigo. PLoS ONE. 2014;9(9). doi:10.1371/journal.pone.0105546. ↑ Sonia Sandhaus, Stop the spinning: Diagnosing and managing vertigo. Nurse Practitioner. 2002 Aug 1;27(8): 11-23. ↑ 7.0 7.1 Maia FZE. New treatment strategy for apogeotropic horizontal canal benign paroxysmal positional vertigo. Audiology Research. 2016;6(2). doi:10.4081/audiores.2016.163. ↑ Gaur S, Awasthi SK, Bhadouriya SKS, Saxena R, Pathak VK, Bisht M. Efficacy of Epley’s Maneuver in Treating BPPV Patients: A Prospective Observational Study. International Journal of Otolaryngology. 2015;2015:1-5. doi:10.1155/2015/487160. ↑ 13.0 13.1 13.2 Balatsouras DG, Koukoutsis G, Ganelis P, Korres GS, Kaberos A. Diagnosis of Single- or Multiple-Canal Benign Paroxysmal Positional Vertigo according to the Type of Nystagmus. International Journal of Otolaryngology. 2011;2011:1-13. doi:10.1155/2011/483965. ↑ Mayo Clinic: Benign Paroxysmal Positional Vertigo. http://www.mayoclinic.com/health/vertigo/DS00534 (Accessed 19 March 2011). ↑ Strupp M, Dieterich M, Brandt T. The Treatment and Natural Course of Peripheral and Central Vertigo. Deutsches Ärzteblatt International . 110(29):505-516. ↑ Hain TC, Uddin M., Pharmacological treatment of vertigo.CNS Drugs. 2003;17(2):85-100. ↑ Maslovara, S. (2014). Importance of accurate diagnosis in benign paroxysmal positional vertigo (BPPV) therapy.Med Glas,11(2).